92 Greenwich Street, New York, NY 10006. 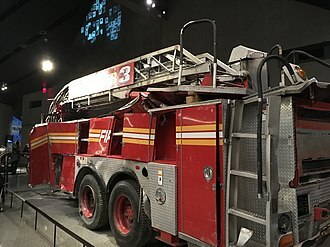 The 9/11 Tribute Museum, formerly known as the 9/11 Tribute Center and Tribute WTC shares personal stories of family members who lost loved ones, survivors, rescue and recovery workers, volunteers, and Lower Manhattan residents with those who want to learn about the September 11 attacks. It is located in the World Trade Center section of Manhattan, New York City and provides walking tours and galleries with 9/11 artifacts and history. The 9/11 Tribute Museum provides education experiences for visitors and a central place for the local community and victims' families and friends to gather and share their personal experiences with the public. Through walking tours, exhibitions and programs, the 9/11 Tribute Museum connects visitors with people who directly experienced the events of the February 26, 1993 bombing and September 11, 2001 attacks. The Tribute Museum has hosted more than four million visitors from all over the world. The 9/11 Tribute Museum is a 501(c)3 non-profit, and is a project of the September 11th Families' Association. The 9/11 Tribute Museum, formerly known as the 9/11 Tribute Center and Tribute WTC Visitor Center, is a project of the September 11th Families’ Association. 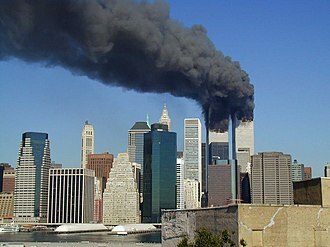 The September 11th Families’ Association was created by widows and other family members of those killed in the 9/11 attacks. The Association established a mission to unite and support all victims of terrorism through communication, representation and peer support. The 9/11 Tribute Center opened on September 6, 2006, across the street from the World Trade Center site and next to the Engine 10/Ladder 10 Firehouse of the New York City Fire Department. It was located in the former Liberty Deli, where meals and supplies were given to rescue workers in the attacks' aftermath. The Association renovated the space to create an educational center with photos, artifacts, and stories shared by the community. In June 2017 it moved to 92 Greenwich Street, a location that provides it with more exhibit space. 9/11 Tribute Museum volunteer giving a guided tour of the 9/11 Memorial. The 9/11 Tribute Museum has trained guides who have personal 9/11 experiences. The 9/11 Tribute Museum is open to the public and organizes 40 tours a week; these tours are one hour 15 minutes long. 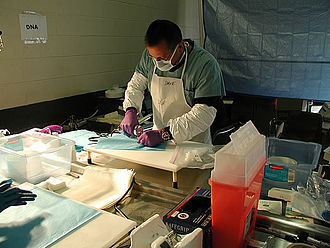 The Education Department also offers learning programming, professional development, and workshops. The museum has three floors. All galleries are Americans with Disabilities Act-compliant. The National September 11 Memorial & Museum is a partner of the 9/11 Tribute Museum and serves as the primary memorial to the events September 11, 2001. Aside from the memorial constructed at Ground Zero, there are many other memorials built by various communities and municipalities throughout the United States. Many of these memorials are built around a remnant of steel from the destroyed towers. These remnants have been donated by the Port Authority of New York and New Jersey through a program that has distributed more than 1,000 pieces of World Trade Center steel. ^ catty. "Traveling to NYC??? Enjoy the 3rd Annual "Night at the Museums" on June 21". Jewish Voice. Retrieved 2016-06-08. ^ "Richard Dodd: 14 years later, another memorial". NY Daily News. Retrieved 2016-06-08. ^ "History - 9/11 Tribute Center". 9/11 Tribute Center. Archived from the original on August 28, 2014. Retrieved June 8, 2016. ^ "9/11 Tribute Center Going Strong Despite Opening Of National Museum". Retrieved 2016-06-08. ^ Egbert, Bill (2017-06-15). 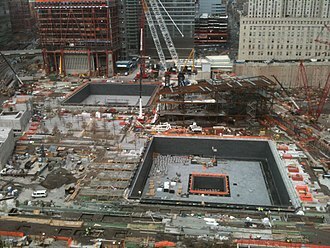 "Bigger space, broader mission for 9/11 Tribute Museum". Downtown Express. Retrieved 17 June 2017. ^ "Visiting New York's 9/11 sites: What you need to know | Fox News". Fox News. 2014-09-11. Retrieved 2016-06-08. ^ "9/11 Memorial Live Stream 2015: Watch New York Anniversary Ceremony At September 11 Memorial Plaza". International Business Times. 2015-09-11. Retrieved 2016-06-08. ^ "The 9/11 Memorial Tribute Walking Tour". The Huffington Post. 2012-08-19. Retrieved 2016-06-08. ^ "World Trade Center steel to be part of Cedar Rapids 9/11 ceremony". The Gazette. Retrieved 2016-06-08. The New York City Fire Department is the largest municipal fire department in the United States and the second largest in the world after the Tokyo Fire Department. The FDNY employs approximately 10,200 uniformed firefighters and over 3,940 uniformed EMTs, paramedics and its regulations are compiled in title 3 of the New York City Rules. The FDNYs motto is New Yorks Bravest, the FDNY serves more than 8 million residents within a 320 square mile area. The FDNY headquarters is located at 9 MetroTech Center in Downtown Brooklyn, there are Three Bureau of Fire Communications alarm offices which receive and dispatch alarms to appropriate units. One office, at 11 Metrotech Center in Brooklyn, houses Citywide, the Bronx houses Manhattan and the Bronx, and Queens houses Queens. The current Fire Commissioner is Daniel A. Nigro, who took over the position from Salvatore J. Cassano in June 2014. Staff chiefs include the seven citywide tour commanders, the Chief of Safety, the Chief of Fire Prevention and geographically, the department is nominally organized into five Borough Commands for the five traditional Boroughs of New York City. Within those five Borough Commands exists nine firefighting Divisions, each headed by a Deputy Division Chief, within each Division are four to seven Battalions, each led by a Battalion Chief. Each Battalion consists of three to eight firehouses and consists of approximately 180–200 firefighters and officers, each firehouse consists of one to three fire companies. Each fire company is led by a captain, who commands three lieutenants and nine to twenty firefighters, there are currently four shifts of firefighters in each company. Tours can be either night tours or day tours, the FDNY faces highly multifaceted firefighting challenges in many ways unique to New York. 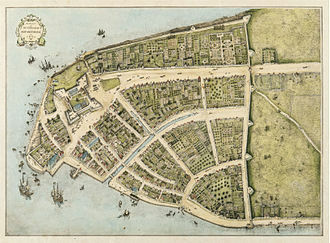 The origins of the New York City Fire Department go back to 1648 when the first fire ordinance was adopted in what was the Dutch settlement of New Amsterdam. 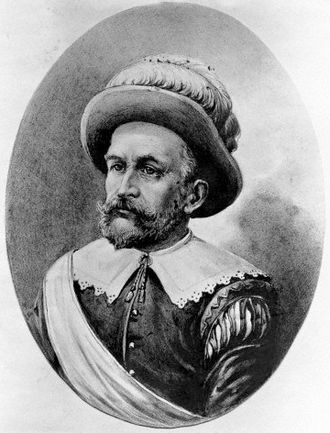 Peter Stuyvesant, within one year of his arrival, appointed four fire wardens to wooden chimneys of thatched-roofed wooden houses, the first four fire wardens were Martin Krieger, Thomas Hall, Adrian Wyser, and George Woolsey. 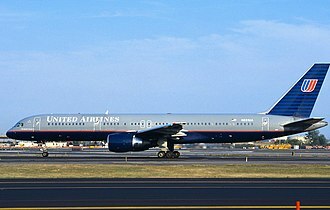 The Boeing 757-223 aircraft serving the flight was hijacked by five men affiliated with al-Qaeda on September 11,2001, as part of the September 11 attacks. Less than 35 minutes into the flight, the hijackers stormed the cockpit and they forced the passengers and pilots to the rear of the aircraft. Hani Hanjour, one of the hijackers who was trained as a pilot, unknown to the hijackers, passengers aboard made telephone calls to friends and family and relayed information on the hijacking. The hijackers crashed the aircraft into the side of the Pentagon at 09,37 EDT. Many people witnessed the crash, and news sources began reporting on the incident within minutes, the impact severely damaged an area of the Pentagon and caused a large fire. 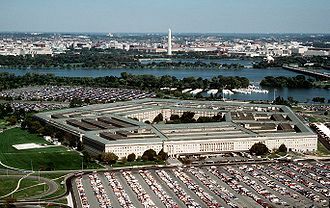 A portion of the building collapsed, firefighters spent days working to fully extinguish the blaze, the damaged sections of the Pentagon were rebuilt in 2002, with occupants moving back into the completed areas that August. The 184 victims of the attack are memorialized in the Pentagon Memorial adjacent to the crash site, the 1. 93-acre park contains a bench for each of the victims, arranged according to their year of birth and ranging from 1930 to 1998. 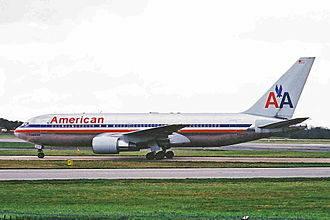 The hijackers on American Airlines Flight 77 were led by Hani Hanjour, Hanjour first came to the United States in 1990. Hanjour trained at the CRM Airline Training Center in Scottsdale, Arizona and he had wanted to be a commercial pilot for the Saudi national airline but was rejected when he applied to the civil aviation school in Jeddah in 1999. Hanjours brother explained that, frustrated at not finding a job, Hanjour increasingly turned his attention toward religious texts and cassette tapes of militant Islamic preachers. Hanjour returned to Saudi Arabia after being certified as a pilot, Hanjour likely went to Afghanistan, where Al-Qaeda recruits were screened for special skills they might have. Already having selected the Hamburg cell members, Al Qaeda leaders selected Hanjour to lead the team of hijackers. Two FBI agents inside the unit tried to alert FBI headquarters, in December 2000, Hanjour arrived in San Diego, joining muscle hijackers Nawaf al-Hazmi and Khalid al-Mihdhar, who had been there since January 2000. Greenwich Street is a north-south street in the New York City borough of Manhattan. 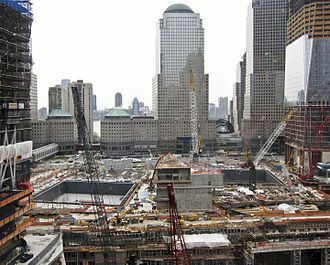 As the World Trade Center is redeveloped, the sections will be reconnected. Main east-west streets crossed include, from north to south, Christopher Street, Houston Street, Canal Street, Greenwich Street travels through the Meatpacking District, the West Village, Hudson Square, and Tribeca. 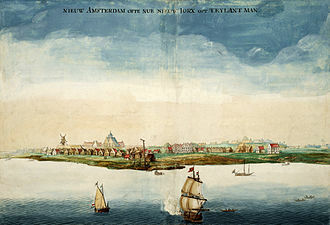 North of Canal Street, traffic travels northbound on Greenwich Street, south of Canal Street, the earliest documentation of Greenwich Street came in the 1790s, when it ran parallel to the Hudson River. 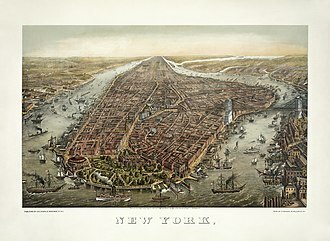 At that time it was called Road to Greenwich, as it was the continuous road from Lower Manhattan to Greenwich Village other than Broadway. Greenwich Street still maintained its status as an address in 1820, but by the 1850s, the wealthy residents had fled uptown. One who stayed for a time was hotel owner Amos Eno, in 1873, the Butter and Cheese Exchange opened on the street, not far from where dairy products arrived daily at the freight railroad terminals. 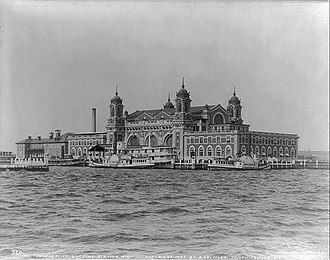 By 1882, a generation plant of the New York Steam Company was located at Greenwich. 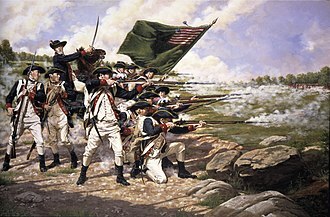 In 1824, painter Thomas Cole, who had arrived in the U. S. in 1818, maintained his residence in a garret on Greenwich Street, exhibiting his paintings in local shops. Also located on Greenwich Street in the mid-1800s was one of the outlets of Madame Restell, actually Ann Lohman. The Greenwich Street location doubled as a facility for women who wanted to bear their child. Restell, who got rich running her enterprises, was arrested a number of times, but was able to buy her way out of trouble, and eventually built a mansion at Fifth Avenue and 52nd Street. In 1867, engineer Charles T. Harvey managed to get permission from the New York State Legislature to build a short stretch of elevated track as an experiment, this would become the Ninth Avenue El, which was demolished in 1940. Greenwich means Green village, with the derived from Latin vicus through Saxon wick. 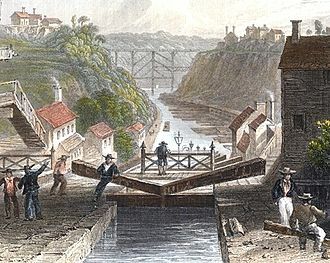 Of the two roads, Greenwich Street was the shorter, more scenic and popular route to the village, but often flooded until the 19th century, the IRT Broadway – Seventh Avenue Line runs under Greenwich Street from Vesey Street south to its end. 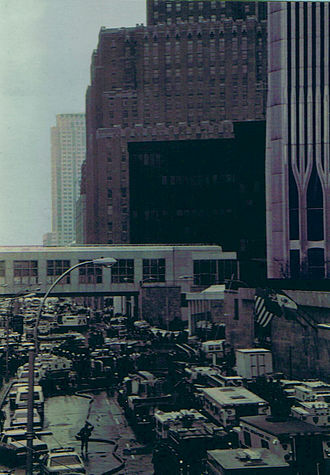 The 1,336 pounds urea nitrate–hydrogen gas enhanced device was intended to send the North Tower crashing into the South Tower, bringing both towers down and killing tens of thousands of people. It failed to do so but killed six people and injured over a thousand, the attack was planned by a group of terrorists including Ramzi Yousef, Mahmud Abouhalima, Mohammad Salameh, Nidal A. Ayyad, Abdul Rahman Yasin, and Ahmed Ajaj. 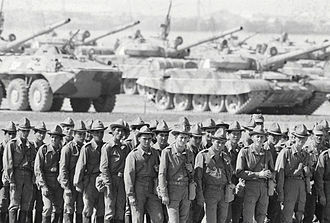 They received financing from Khaled Sheikh Mohammed, Yousefs uncle, in March 1994, four men were convicted of carrying out the bombing, Ajaj and Salameh. The charges included conspiracy, explosive destruction of property, and interstate transportation of explosives, in November 1997, two more were convicted, Ramzi Yousef, the mastermind behind the bombings, and Eyad Ismoil, who drove the truck carrying the bomb. Yousef arrived illegally in the United States on September 1,1992, traveling with Ahmed Ajaj from Pakistan, Ajaj tried to enter with a forged Swedish passport, though it had been altered and thus raised suspicions among INS officials at John F.
Kennedy International Airport. When officials put Ajaj through secondary inspection, they discovered bomb-making instructions and other materials in his luggage, the name Abu Barra, an alias of Mohammed Jamal Khalifa, appeared in the manuals. Yousef tried to enter with a false Iraqi passport, claiming political asylum, Yousef was allowed into the United States, and was given a hearing date. Yousef set up residence in Jersey City, New Jersey, traveled around New York and New Jersey and called Sheikh Omar Abdel Rahman, a controversial blind Muslim cleric, via cell phone. He ordered chemicals from his room when injured in a car crash – one of three accidents caused by Salameh in late 1992 and early in 1993. El Sayyid Nosair, one of the blind men, was arrested in 1991 for the murder of Rabbi Meir Kahane. According to prosecutors, the Red Mahmud Abouhalima, convicted in the bombing, in the initial court case in NYS Criminal Court Nosair was acquitted of murder but convicted of gun charges. According to the journalist Steve Coll, Yousef mailed letters to various New York newspapers just before the attack, in which he claimed he belonged to Liberation Army, Fifth Battalion. As a result, most of the events listed below were known by a large portion of the planets population as they occurred. All times given are in Eastern Daylight Time, or UTC−04,00, American Airlines Flight 11, a Boeing 767 carrying 81 passengers and 11 crew members, departs 14 minutes late from Logan International Airport in Boston, bound for Los Angeles International Airport. 8,14, Flight 11 is hijacked over central Massachusetts,8,20, American Airlines Flight 77, a Boeing 757 with 58 passengers and six crew members, departs 10 minutes late from Washington Dulles International Airport, for Los Angeles International Airport. 8,42, United Airlines Flight 93, a Boeing 757 with 37 passengers and seven members, departs 42 minutes late from Newark International Airport. 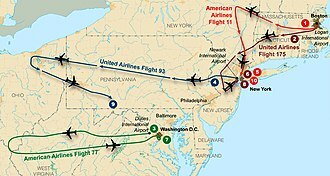 8, 42–8,46, Flight 175 is hijacked above Albany, New York, about 140 miles north of New York City, turning south. 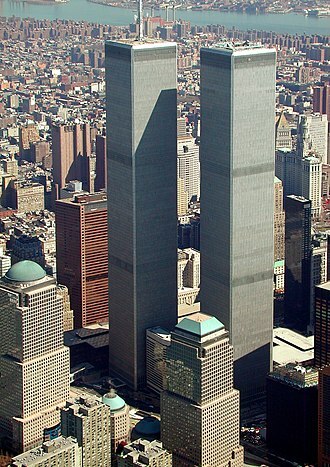 8,46,40, Flight 11 crashes into the face of the North Tower of the World Trade Center. The aircraft enters the tower intact,8, 50–8,54, Flight 77 is hijacked above southern Ohio, turning to the southeast. 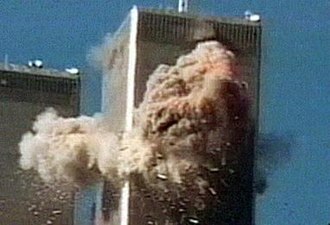 9,03,00, Flight 175 crashes into the face of the South Tower of the World Trade Center. 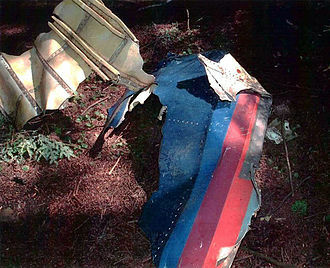 Parts of the plane, including the engine, leave the building from its east and north sides. 9,28, Flight 93 is hijacked above northern Ohio,9,37,46, Flight 77 crashes into the western side of The Pentagon and starts a violent fire. 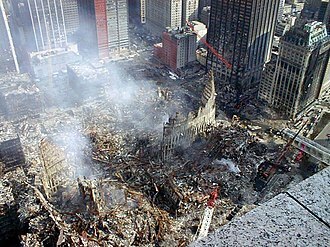 9,59,00, The South Tower of the World Trade Center collapses,56 minutes after the impact of Flight 175. 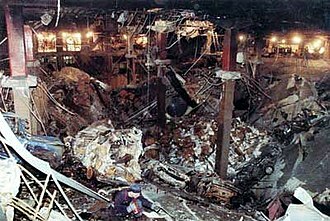 10,03,11, Flight 93 is crashed by its hijackers and passengers, due to fighting in the cockpit 80 miles southeast of Pittsburgh in Somerset County, reports indicate that passengers had learned about the World Trade Center and Pentagon crashes and were resisting the hijackers. The 9/11 Commission believed that Flight 93s target was either the United States Capitol building or the White House in Washington,10,28,22, The North Tower of the World Trade Center collapses,1 hour,42 minutes after the impact of Flight 11. The Marriott Hotel, located at the base of the two towers, is destroyed,10,50,19, Five stories of part of the Pentagon collapse due to the fire. 5,20,33 p.
United Airlines Flight 175 was a scheduled domestic passenger flight from Logan International Airport, in Boston, Massachusetts, to Los Angeles International Airport, in Los Angeles, California. They made several attempts to contact the cockpit. Unknown to the hijackers, several passengers and crew made phone calls from the plane to loved ones and provided information about the hijackers and injuries to passengers. The aircraft crashed into Tower Two of the World Trade Center at 09,03, the Flight 175 hijacking was coordinated with that of American Airlines Flight 11, which struck the top of Tower One 17 minutes earlier. The crash of Flight 175 into the South Tower was the only impact seen live on television around the world as it happened, the impact and subsequent fire caused the South Tower to collapse 56 minutes after the crash, resulting in hundreds of additional casualties. 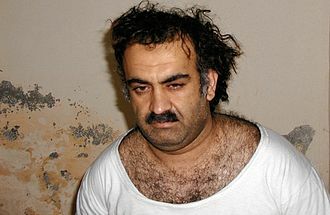 During the recovery effort at the World Trade Center site, workers recovered and identified remains from Flight 175 victims, the team of hijackers on United Airlines Flight 175 was led by Marwan al-Shehhi, from the United Arab Emirates. Shehhi obtained a pilots license while training in south Florida, along with Flight 11 hijacker and plot coordinator. 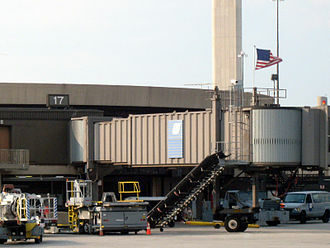 The muscle hijackers on Flight 175 included Fayez Banihammad, from the UAE, in early September 2001, the Flight 175 group of hijackers arrived in Boston from Florida. Hamza al-Ghamdi and Ahmed al-Ghamdi arrived together on September 7 and checked into the Charles Hotel in Cambridge, the next day, they relocated to the Days Inn in Boston. Fayez Banihammad flew from Florida to Boston, along with Mohand al-Shehri, on September 8, Marwan al-Shehhi arrived in Boston on September 9 and stayed at the Milner Hotel, where he shared a room with Flight 11 hijacker Mohamed Atta. The flight was operated with a Boeing 767-200, registration number N612UA, built and delivered in 1983, Hamza al-Ghamdi and Ahmed al-Ghamdi checked out of their hotel and called a taxi to take them to Logan International Airport. They arrived at the United Airlines counter in Terminal C at 06,20 Eastern Time, both hijackers indicated they wanted to purchase tickets, though they already had paper tickets. The September 11 attacks transformed the first term of President George W. Bush and led to what he has called the Global War on Terrorism. 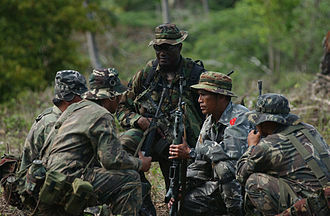 The accuracy of describing it as a war and the political motivations, the US government increased military operations, economic measures and political pressure on groups it accused of being terrorists, as well as on governments and countries accused of sheltering them. 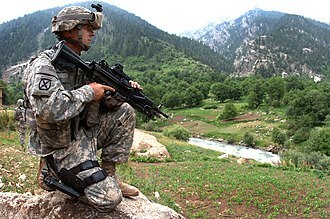 October 2001 saw the first military action initiated by the US, under this policy, the NATO invaded Afghanistan in order to remove the Taliban regime and to capture al-Qaeda forces. 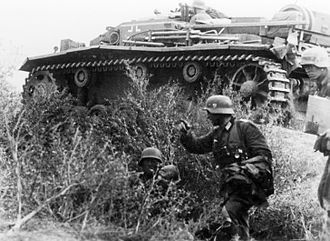 The war, however, is ongoing and has not been won, the US government has asserted that the US invasion of Iraq is connected to 9/11. The September 11 attacks precipitated a focus on security issues and the creation of a new cabinet-level federal agency. The USA PATRIOT Act of 2001 was passed soon after the attacks, giving law enforcement agencies sweeping search and this led to the creation in 2002 of the Information Awareness Office, led by John Poindexter. Critics of the IAO believe it too far in the sacrifice of civil liberties and privacy. 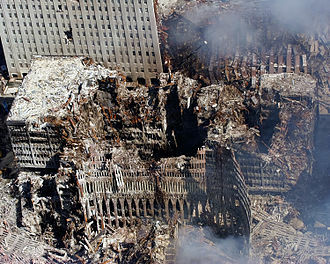 Many major events the United States has hosted since September 11,2001 have been designated National Special Security Events, because of concerns of terrorism. 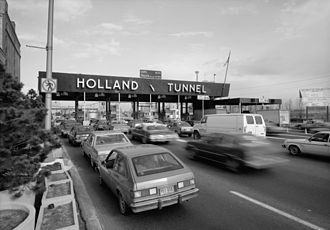 In the immediate aftermath of the September 11 attacks, the United States, other countries imposed similar security restrictions. 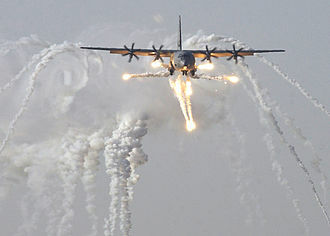 In the United Kingdom, for instance, civilian aircraft were forbidden to fly over London for several days after the attack, the attacks had major worldwide political effects. Many other countries introduced tough anti-terrorism legislation and took action to cut off terrorist finances, law enforcement and intelligence agencies stepped up cooperation to arrest terrorist suspects and break up suspected terrorist cells around the world. 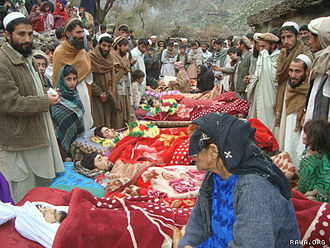 The attack prompted numerous memorials and services all over the world many countries, along with the United States. In Berlin,200,000 Germans marched to show their solidarity with America, the French newspaper of record, Le Monde, ran a front-page headline reading Nous sommes tous Américains, or We are all Americans. A graffiti tribute to 9/11 in Melbourne, Australia that reads "Evil never wins"
The Twin Towers burning from the impact of flights 11 and 175. 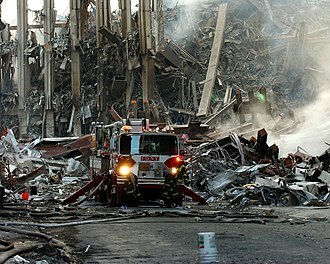 Fires burned amidst the rubble of the World Trade Center for weeks after the attack. 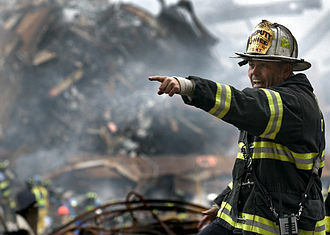 A firefighter watches debris removal at the World Trade Center on September 28th. 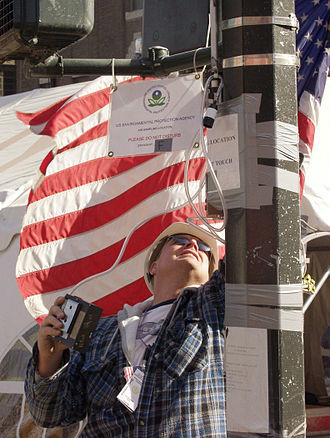 An Environmental Protection Agency employee checks one of the many air sampling locations set up around the site of the World Trade Center. 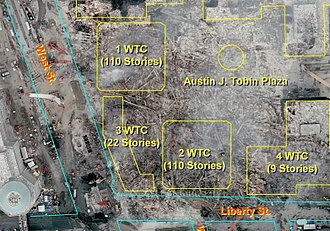 A photo montage of the September 11 attacks. Clockwise from top left: World Trade Center burning; Flight 175 crashes into the south tower; recovery of one of the engines from Flight 93; Pentagon crash video; fireman calls for 10 more rescue workers; Western Ring of the Pentagon. The Pentagon Memorial honoring the victims of the 9/11 terrorist attack on the Pentagon. Russian President Vladimir Putin signs a condolence wall to the foreign fatalities in 9/11. U.S. President George W. Bush talks on a STU-III secure telephone as he watches television coverage of the September 11 attacks from a school classroom in Florida.